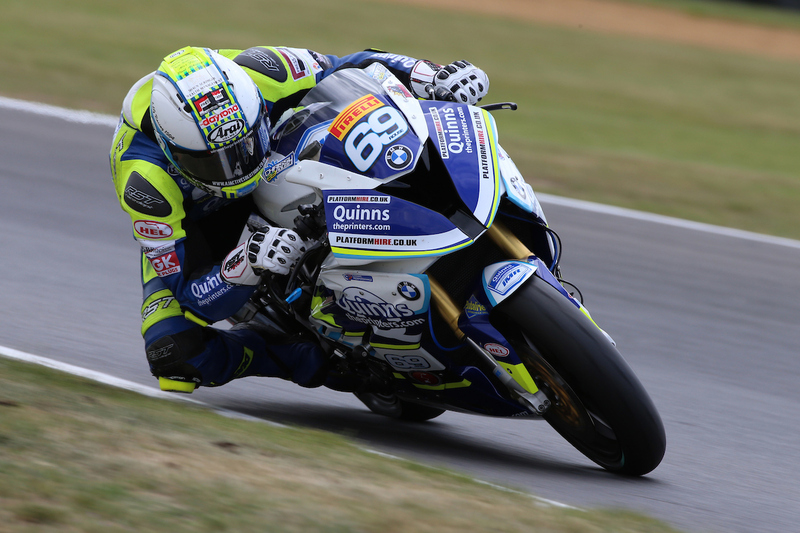 IT’S onwards and upwards for Chrissy Rouse who has vowed to bounce back after crashing out of Sunday’s Pirelli National Superstock 1000 race at Snetterton. Rouse tipped off the Quinnstheprinters.com by Team IMR BMW on the opening lap of the race, after a strong start to the weekend where he had been a consistent front runner. After topping the timesheets in Friday’s first free practice, the Geordie tried a few changes overnight and eventually qualified fourth for the 14-lap race. He ended the session quickest in morning warm-up and had been keen to challenge for the win when the race got underway. But his charge ended early when he high-sided coming out of Palmer’s on the opening lap. Caught by TV cameras walking away clutching his shoulder, Rouse headed to the medical centre to get checked out. A full examination revealed nothing was broken, but the injury is still very painful, and he will now spend the next few weeks recovering so he can be fighting fit for the next round. “Of course I’m disappointed, I really felt I could have been on course for a good result and I’m convinced I could’ve been up there battling for the win,” he said. “I was gutted for my team and sponsors too. Everyone worked really hard over the weekend and the bike was fantastic, so I really wanted to reward them with a strong podium. “But you have to just draw a line under it and move on. You can’t be dwelling on these things and it’s fired me up to come back even stronger at the next round. Rouse will be back out in action for Round Five at Knockhill, Scotland over the weekend July 6, 7 and 8.